There would come a day in my near future that an out of state whitetail hunt may come my way. In order to be ready for this I wanted to finally break down and make the investment in a centerfire rifle that is capable of handling most animals I could chase after. The world of centerfire rifles is very intimidating. For years I have been shooting “old school” and shooting front stuffer Black powder rifles. These offer only a few calibers and I get to develop my own ballistics with the amount of powder and weights of the projectiles. When it came to buying a centerfire rifle the caliber choices were very intimidating. They can almost make your head spin if you think too much about them. There are arguments all over the internet about what you should use and what you shouldn’t. It seems like everyone has their own opinion and thus I had to develop my own. My first step in my purchase was to determine just what manufacturer and model of rifle I was going to invest in. In the past one of the companies that I had worked closely with was Thompson Center. They offer a beautiful rifle that is not only well built but is also very affordable. The one thing that was most important was that the rifle was comfortable in my hands and when the gun was shouldered. The action was also very important. The bolt swing on the Venture is only 70° and this allowed smooth chambering of a second round with a gloved hand and the optics. Form and function were very important in the decision making and the choice was easy after handling several different manufacturers rifles. The Venture fit the bill and the next huge decision was what caliber was the rifle to be purchased in? Being a neophyte when it comes to all of the centerfire ammo I did my research and took into account just what the rifle was to be used for. The hunting situations that I had planned on using it in were certainly taken into account and the availability of ammunition was also a top priority. Given that this rifle would be used on Whitetail, Antelope, Mule deer, wild boar, and possible other big game I chose to go with the 30/06 caliber. Some would argue that this is not enough, but with the variety of loads that are offered this can be loaded up and loaded down depending on the quarry. The other major factor was that you can walk into just about any Walmart, or even gas station in some areas, and find 30/06 ammo. The one thing that was learned in my search for a rifle was that the accuracy of the rifle was not only dependent upon the person behind the trigger, but especially the optics that you put on the rifle. Just when the research for a rifle was over the hunt for the right optics was next on the docket. A few things had to be taken into account when looking at optics. What was my estimated furthest shooting distance, light conditions, and type of reticle I wanted. Given this I settled on a 4 X 12 X 42 scope. I went with the Hawke Endurance model that fit the bill perfectly for what I wanted. Using the Match grade Hawke Mounts this would be a perfect complement to this already stealer rifle. This Hawke scope is an adjustable magnification scope that is adjustable from 4X magnification up to 12X magnification. This adjustment will allow me to take perfect aim at deer in close quarters with the 4X setting. Given a long range shot opportunity at that trophy I can set it to the 12X and really reach out there and be deadly accurate. The 42mm objective allows more ambient light into the scope for low light conditions. To top it all off the scope is fitted with a lighted center dot or the “LR Dot reticle”. This is an adjustable red dot in the center to highlight the reticle center in low light conditions. This lighted dot also allows you to properly put the crosshairs on your target while focusing your attention on the actual target and not the reticle. Too often shooters focus on the reticle and do not pay attention to the actual target that they are aiming at. Doing all the research and picking the components was just part of the fun of choosing a new hunting rifle combo. The assembly process of adding the scope to the rifle went quickly with the Hawke rings and then a few extra minutes to bore sight the rifle then it was time for the range. 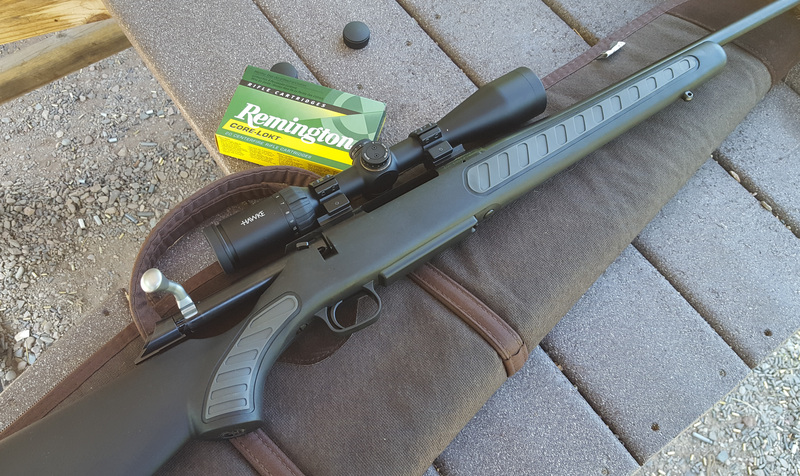 I knew that I was going to be hunting mostly whitetail with this rifle so I chose an easy to find round made by Remington. It is a 150grain core-loc round that can be found in a variety of retailers. Knowing that I had bore sighted I started off at the 50yard mark just to get a feel for how I was hitting the paper. 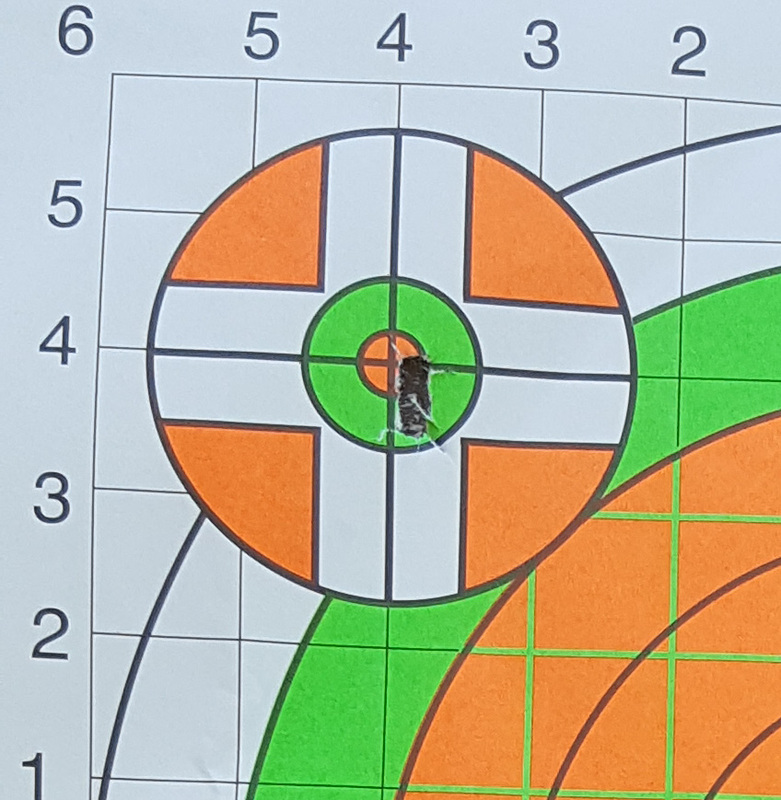 Once my initial adjustments were made to my optics I moved to the 100yard target and true to form the rifle put a 3-round group touching each other right where I needed them to be. This could not have made me happier. The next step is to push out to 200 yards to prove that I can hit the paper without too much user error. The search for a new hunting rifle was certainly eye opening and it is not just a matter of brand recognition or hear-say. You really need to do your research on the firearm, caliber, and your optics and develop your own opinions and facts. Others will have their $.02 to kick in, but you need to go with what you feel is your best option. There are many choices out there and when scanning the interweb or standing at the gun counter of your favorite retailer you could get a bit dizzy. Take your time, do your research, and do what feels best to you. Shoulder many rifles, look through a multitude of scopes, and, if given the chance, shoot several guns/calibers to give you a better idea of what you are looking for. Remember that a hunting rifle is only as good as the person behind it, so once you do pick out the perfect rifle, optics, and caliber practice with it until it feels like it is a part of you. Take the time at the range to learn to use your scope and to know how to quickly fire, chamber a new round and get off a second and accurate shot. You owe it to your quarry to do your due diligence.